The official date of creation of the National Antarctic Scientific Center (at that time the Antarctic Research Center) is June 9, 1993. Its first Director became the Corresponding Member of the National Academy of Sciences of Ukraine Petro Gozhyk. A year before, on July 3, 1992, the President of Ukraine Leonid Kravchuk had issued a resolution on the participation of Ukraine in Antarctic research, and on September 17, 1992, the Verkhovna Rada has adopted the Decree on the Accession of Ukraine to the Antarctic Treaty of 1959. However, in 1992, after the collapse of the Soviet Union, Russia has proclaimed itself the sole successor to the USSR, which allowed it the sole authority to dispose of all assets outside the former Soviet empire, including Antarctic stations. At the request of Ukraine, within the framework of the distribution of assets of the former USSR, to transfer to Ukraine one of the five Antarctic stations operating at that time, Moscow refused, suggesting in exchange providing separate objects from the Russian Antarctic expedition exclusively under leasehold. The Great Britain supported Ukraine declaring its desire to transfer its Faraday station on Galindez Island, Argentine Archipelago (West Antarctica) free of charge. On November 21, 1994, the International Foundation “Vidrodzhennia” had allocated $ 12,000 for the project “Ukraine returns to Antarctica”, so the first Ukrainian specialists have arrived at the Faraday station – Yu. Oskret (station maintenance), G. Milinevsky (scientific programs), O. Liushnivsky (communication) and V. Gergiev (diesel engines) – who worked there from December 17, 1994 to February 15, 1995. On July 20, 1995 in London, the Ambassador of Ukraine to the United Kingdom, Sergiy Komisarenko and David Davis, British Foreign Secretary, have exchanged diplomatic notes on the transfer of the Faraday Antarctic Station to Ukraine; and Director of the Center Peter Gozhyk and the Head of the British Antarctic Service, Ronald B. Heywood, signed that day an appropriate Memorandum of Understanding. 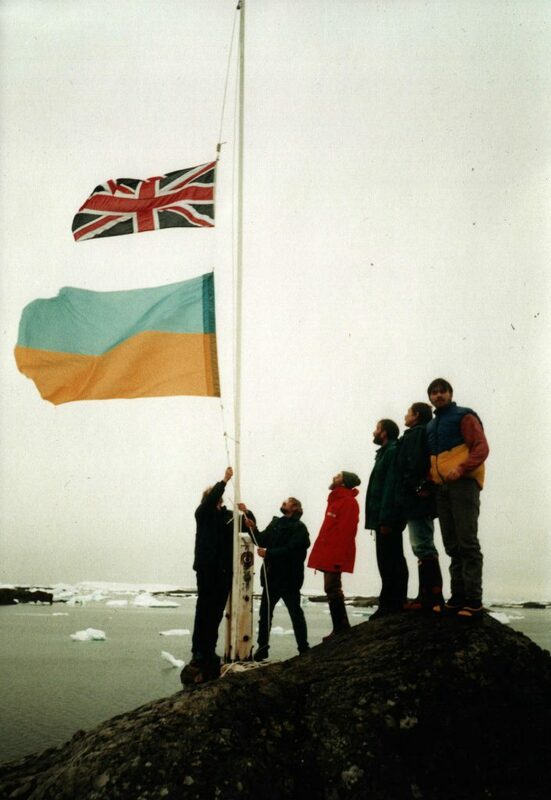 On February 6, 1996, the British flag was solemnly lowered at the station and the state flag of Ukraine was raised for the first time, symbolizing the final stage of transferring the station and renaming it to the Ukrainian Antarctic “Akademik Vernadsky” station. Since then, the Center has become the main organization for conducting research expeditions in Antarctica, coordination of scientific research, selection and training of winterers, and ensuring the vital functions of the station. According to the Decree of the President of Ukraine dated December 15, 1999, the Center was subordinated to the Ministry of Education and Science. Taking into account the national and international importance of comprehensive scientific research in Antarctica, the institution was granted status of a national scientific center by the Decree of the President of Ukraine of December 23, 2004. Thanks to the active efforts of the Center, in the same year Ukraine has received the status of a Consultative Party to the Antarctic Treaty, which gives the state the right to vote for any decision to be taken in a consensual manner concerning all aspects of the organization of human activity in Antarctica and the further development of the international legal regime of the region. To date, the Center has organized and provided 23 Ukrainian Antarctic expeditions and continuous work and research at the station “Academician Vernadsky”. So far, the Center has organized and provided 23 Ukrainian Antarctic Expeditions as well as continuous work and research at Akademik Vernadsky station. The National Antarctic Scientific Center of Ukraine cooperates with a number of authoritative domestic research institutes and dozens of foreign partners, supports Ukraine’s participation in international organizations involved in the study and preservation of the “ice” continent and the Southern Ocean. 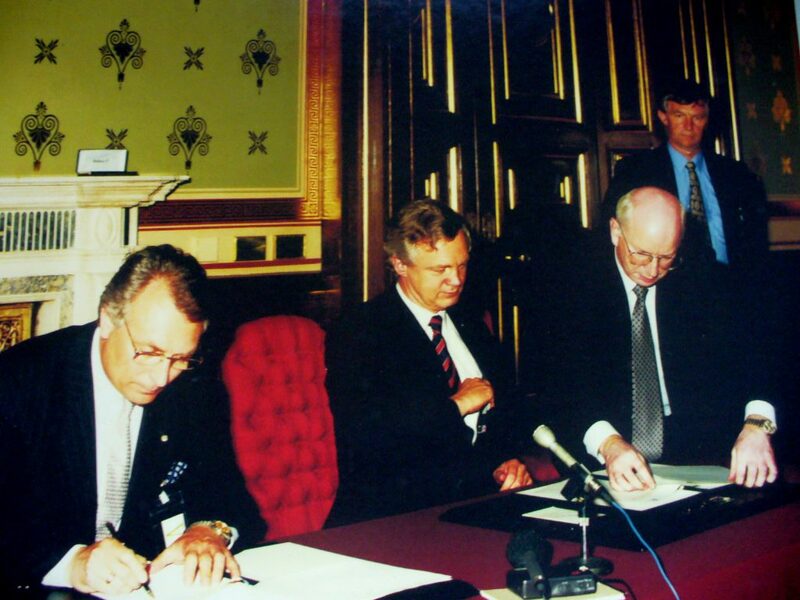 Ambassador of Ukraine to the Great Britain Academician Sergiy Komisarenko and British Foreign Secretary David Davis sign the interstate agreement on the transfer of British Antarctic Faraday station to Ukraine, London, July 20, 1995.